The second column shows the defence rating – which has the same long-term average obviously – where now lower is better. 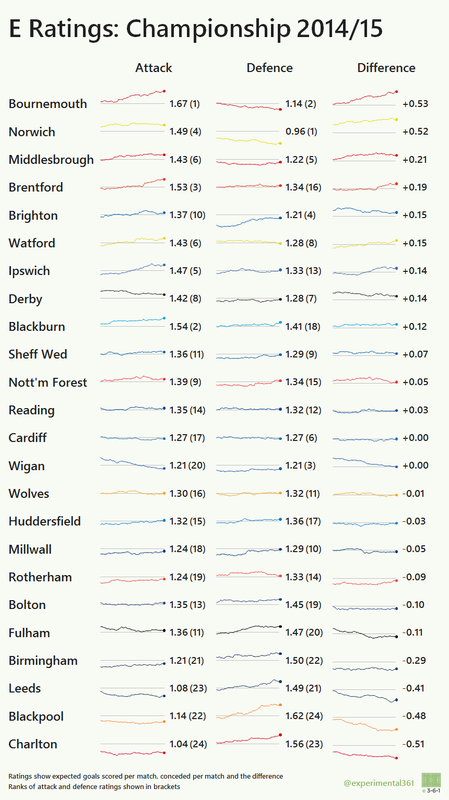 Both Bournemouth and Norwich appear to have deserved their promotions, comfortably out-creating their opponents by over half an expected goal per match. 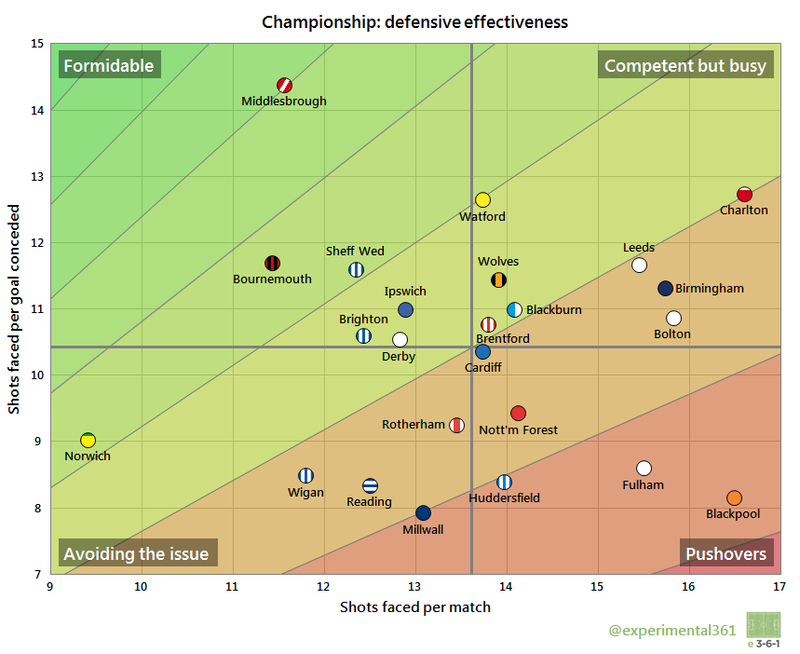 Charlton and Leeds survived despite striking the ball from far less dangerous positions than their opponents, suggesting that both could struggle in 2015/16 without significant improvement. It looks like Wigan‘s deteriorating attack was primarily to blame for their relegation: their defensive performances were consistently above average, but their attack rating dropped from one of the best to one of the worst over a single campaign. Whatever Fulham changed after the first few months of the season blew a big hole in their defence, which was relatively average to begin with before starting to haemorrhage goals. 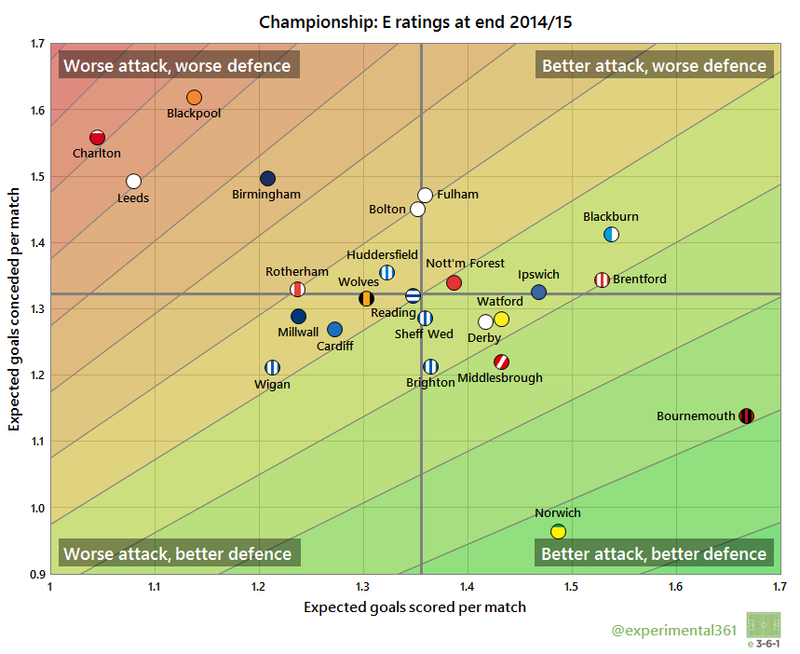 The superiority of Bournemouth and Norwich is clearly visible, as are the worrying performances of Charlton and Leeds. Despite Gary Rowett’s successful rescue of Birmingham, their expected goals ratings hardly budged, which is pretty interesting. Certainly at the back they continued to allow plenty of chances but were adept at soaking these up – the question is whether they can continue to do so.